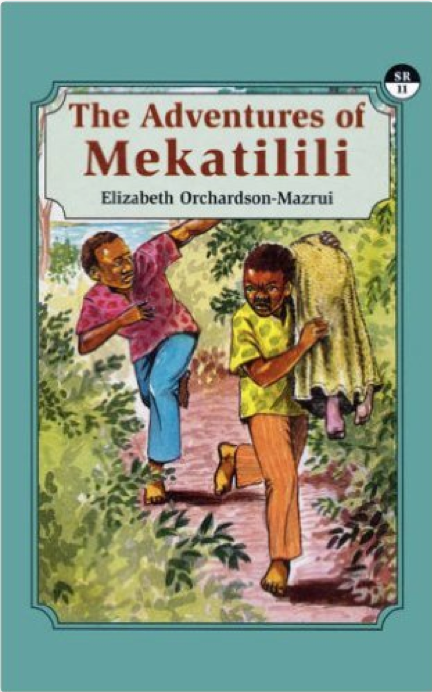 The Adventures of Mekatilili is written by Elizabeth Orchardson-Mazrui and takes place in Galana. It also takes place a white mission station, in Kenya. The story also takes place in Kaya Fungo , a holy place to the Mijikenda people that is a clearing surrounded by a forest, during colonial times. The main character of the story is Mekatilili also known as Menyaziwa wa Menza. She is adventurous and curious. She does not want to cook, sweep compounds, collect firewood or fetch water. She wants to go hunting with the boys. She lives in Galana with many of her extended family and her friends. Two weeks into her trip to Kaya Fungu, her grandmother sends her to get some plants for a sick boy. Mekatilili accidently wanders too far. She is kidnapped by two white missionaries and taken out of Kaya Fungu. She is given to an African man and woman. When they get to the Mission Station, the man and woman told a fake story. They said that Mekatilili was their child and that their other two children had died of the drought. They also left Mekatilili at they mission station, saying they wanted her to become Christian. The strangers also received a lot of money to help them during the drought. Mekatilili did not particularly like the mission station. She spent many months gathering information and trying to persuade the leaders of the mission station that her story was true. But they didn’t believe her. So instead, she made an escape plan. She would come outside the building, climb over the gate, and follow the path until the point where the paths split into many paths. Then she would take the path that leads to Kaya Fungo. Her plan went into action on the right day, when she escaped and got back to Kaya Fungo, reuniting with her family and friends. The theme of this story is to always listen to your elders and pay attention to what you are doing and where you are going. Mekatilili failed to do this and was kidnapped. Though it was all okay when she returned. My opinion about this story is that I like it because it is about a preteen. She is adventurous and smart. I think it is a good story for anyone who wants to learn about the history of the Mijikenda or Wagiriama. The Wagiriama is a sub-group of the Mijikenda.